We hope that you have made a good beginning to Lent so far. If not, nunc coepi! – Now I begin (again)! 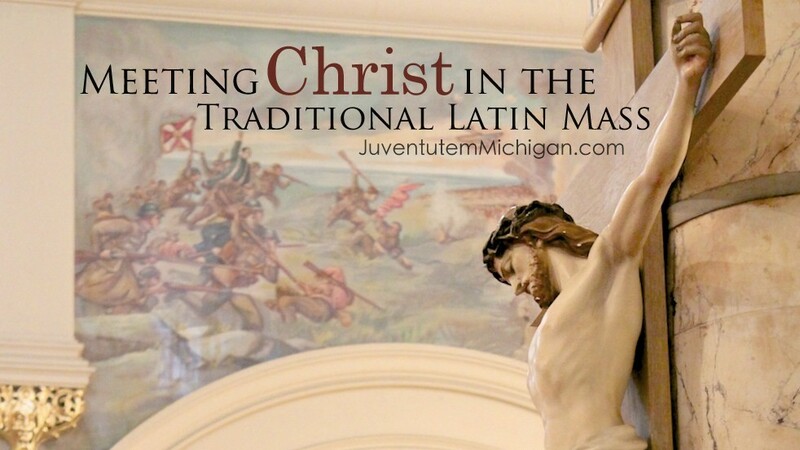 Please see below for some notes on this week’s Lenten Embertide and, in particular, our request for your alms to assist Juventutem Michigan in promoting the holiness of young adults by means of the Church’s Tradition. This Wednesday, Friday, and Saturday we again have the opportunity to observe the Lenten Ember Days – Ember Wednesday (3/8), Ember Friday (3/10), and Ember Saturday (3/10), which fall during the first full week of Lent. Locally, one may attend the Ember Masses at Assumption Grotto – Wednesday and Friday at 7:30 a.m. and 7:00 p.m.; Saturday at 7:30 a.m. – or at St. Joseph Oratory – Wednesday at noon; Friday at 8:00 a.m.; Saturday at 9:00 a.m.
As the Cathechism says – and as the popes have consistently reminded us – prayer, fasting, and almsgiving are to be a Christian’s particular focus during Lent and will help him or her in preparing for Easter. … for in almsgiving one gives something to someone from whom one does not expect to receive anything in return. Gratuitousness should be one of the characteristics of the Christian, who aware of having received everything from God gratuitously, that is, without any merit of his own, learns to give to others freely. Today gratuitousness is often not part of daily life where everything is bought and sold. Everything is calculated and measured. Almsgiving helps us to experience giving freely, which leads to freedom from the obsession of possessing, from the fear of losing what we have, from the sadness of one who does not wish to share his wealth with others. We call this exhortation to your attention because we need your help. This Wednesday – the Wednesday of Embertide – we will be launching a GoFundMe campaign that aims to underwrite the next 12 months’ worth of such opportunities. We ask that you prayerfully consider supporting our cause at this time and encouraging your friends and contacts to do the same. If you would like to be sent an email reminder at the hour that the campaign launches, please reply to this email with such a request. Registration begins at 7 a.m. OF Mass at 8 a.m. Benediction at 3:45 p.m. EF Mass at 6:00 p.m. Guest Speakers include: Auxiliary Bishop Robert Fisher; Msgr. Anthony Figueiredo; Erin Mersino; Fr. Stephen Pullis; Fr. William Wagner, O.R.C. ; Sister M. Donata, O.L.M. ; David Geisser – (former) Swiss Guard; Fr. Willy Raymond, C.S.C. SS. 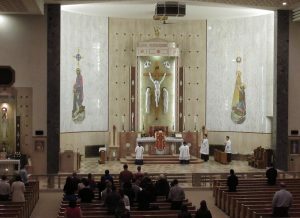 Cyril & Methodius Parish (Sterling Heights) was one of the first local parishes to add a weekly Tridentine Mass soon after the promulgation of Summorum Pontificum in 2007 – in their case a Saturday evening 6:00 p.m. (anticipated) Sunday Mass. Pastor Fr. Ben Kosnac has decided to add occasional Sunday Tridentine Masses to the schedule, the first taking place this Sunday, March 12 at 9:30 a.m. Organist Joe Long has taken over organizing the music for the parish’s Tridentine Masses. Joe has helped out at Lakeport’s St. Edward on the Lake parish, and his father is Ray Long, the longtime organist at Assumption Grotto. Diocese of London Auxiliary Bishop Joseph Dabrowski will make his first pastoral visit to the St. Benedict Tridentine Community on Sunday, March 12. He will attend the 2:00 p.m. Tridentine Mass at St. Alphonsus Church and will preach the homily. All are invited to a reception for the bishop in the parish hall after Mass. We hope you can attend the Mass and bring friends and family to demonstrate our strong local support for the Traditional Liturgy. March 19, 2017, the Third Sunday of Lent, will be the fifth anniversary of Juventutem Michigan’s affiliation to the Fœderatio Internationalis Juventutem. Interested young adults are welcome to come together for the 9:00 a.m. Low Mass at St. Joseph Oratory and then a celebratory breakfast elsewhere in the City of Detroit. For the fifth consecutive year, Juventutem Michigan will be present at the Michigan Catholic Young Adult Conference. We will organize a Saturday morning daily EF Mass for the conference for the 4th time. 7:45 a.m. – Please plan to attend the Mass and the conference. Please register for the conference soon in order to receive the discounted ~$50 registration rate. If any Juventutem members would be traveling more than 90 minutes to attend the conference in Canton, we’d be glad to find a another member’s couch for you to sleep on – let us know. In honor of the 50th anniversary of the Instruction Musicam sacram (promulgated March 5, 1967), a Declaration on Sacred Music Cantate Domino, signed by over 200 musicians, pastors, and scholars from around the world, was published yesterday in six languages. The declaration argues for the continued relevance and importance of traditional sacred music, critiques the numerous serious deviations from it that have plagued the Catholic Church for the past half-century, and makes practical suggestions for improving the situation. We encourage you to read it all. Local signatories included Prof. Blosser from Sacred Heart Major Seminary, organist / cantor Wassim Sarweh, and pastor / director Fr. Eduard Perrone. Organized by the founder of Juventutem Boston and a founder of Juventutem Trenton, Pro Civitate Dei is a seven day Anglophone program in southern France in early June which seeks to foster the restoration of Western culture in a rich liturgical and intellectual environment inspired by Christian conviviality. Pro Civitate Dei brings together a small number of select young men and women to discuss the renewal of Christian civilization in one of the most beautiful settings of the French Riviera. The program features lectures by high-level American and European university faculty in a rich intellectual and spiritual environment fostered by the clergy of the Fraternity of St. Joseph the Guardian, a religious order of North and South Americans dedicated to missionary work in the heart of Old World. If you’d like to learn more, send us an email. Some JM members are considering the trip. We commend to your attention these two recent statements, each published by one of the “John Senior bishops” that the American midwest is privileged to call its own. … All priests ministering in the Archdiocese possess the faculty to dispense (remove) or commute (replace with something else) the obligation for an individual or family to abstain from meat on the Fridays of Lent. Therefore, those wanting to partake in a celebratory meal on St. Patrick Day that includes meat simply need to talk to a priest, who may grant this ‘for a just reason.’ Priests should keep in mind the option to ‘commute the obligation to other pious works’ rather than giving an outright dispensation, and that their faculty ‘may not be used to dispense the entire parish’ from the obligation. Please see the AoD statement. The faithful of Gaylord and Kalamazoo may opt into a dispensation themselves, according to certain conditions. We’re not aware of statements from the state’s other four Ordinaries.